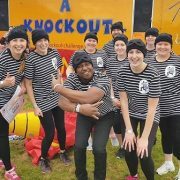 Some fancy dress costume ideas for Its A Knockout teams for 2017 ! 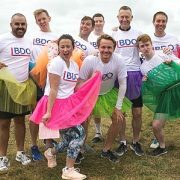 One thing that really adds some colour and fun to our It’s A Knockout’s is for the teams to fancy dress themselves for the occasion. 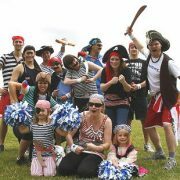 As teams arrive for our days if the Knockout staff see a crowd of Pirates or Minions approaching we know we’re in for a fun days games. We introduced the fancy dress teams idea about 20 years ago and it does a couple of bonus things for the day. First, it helps us with the scoring. “Pirates in lane one please, Minions in lane two and Brave Hearts in lane three” Another, is that it starts to hype the teams up before the day by making them get together and discuss and make costumes. We say “make”, but eBay tends to be the option for many teams looking for the quick fix or a trip to Primark for Onesie’s! One thing to remember is no pins and sharp bits. So Pirates, you won’t be able to keep those swords on whilst doing the games, and the same goes for name tag pins or safety pins. Here’s a list of the most common fancy dressed ideas. 118-118’s (above), Super Heroes, Pirates, Clowns, 80’s/Retro (get the dayglow tops out), Cops & Robbers, Nurses & Doctors (above), Baywatch (above), Where’s Wally..
Just remember, that you need to be able to take part in the games freely. It might tear clambering across the inflatables. And, it will get wet. As a team last year found out when they dressed as babies, complete with adult nappies, which then filled with water! One, extra thing. 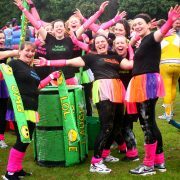 We do give extra It’s A Knockout points to the teams if they come in fancy dress. 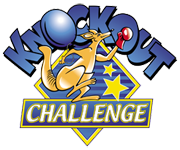 If you are attending a charity fundraising It’s A Knockout in 2017 ( maybe go to our Events Page ) get together and start brain storming now. For organisers, you can even suggest themes. Countries (Mad Mexican’s, Funny French, Jammy Jamaican’s) or Films (Gladiators, Keystone Cops, Marvel). No doubt, we’ll add another post later this year with more fancy dress ideas from this years events.